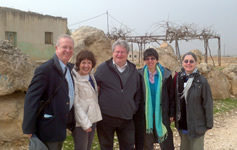 Rabbi Howard Cooper took part in the 2012 trip to Israel and the occupied Palestinian Territories organised by British Friends of Rabbis for Human Rights. 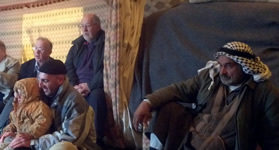 His personal reflections on the visit were first published on the MRJ website . Take a bunch of British Reform and Liberal rabbis, mix in a few lawyers, judges and anti-racism workers, add a sprinkle of youngsters concerned with social justice issues, shake them up vigorously – and what do you get? The latest visit to Israel by the British Friends of Rabbis for Human Rights. Rabbis for Human Rights was established in Israel in 1988 by the American-born Reform Rabbi David Forman in order to give voice in the contemporary Israeli setting to the Judaism’s traditional concern for the ‘stranger’, the ‘outsider’ and the disadvantaged. Their initial focus was primarily on protecting the human rights of Palestinians in areas controlled by Israel; but they rapidly expanded their work to embrace the rights of vulnerable and minority groups throughout Israeli society. Our week-long tour, organised by the MRJ’s new Movement Rabbi, Laura Janner-Klausner, and the Chief Executive of Liberal Judaism, Rabbi Danny Rich – in itself a brilliant advert for the advantages of close co-operation between the two groupings – allowed participants to meet, study and travel with a series of inspirational and charismatic RHR rabbis – and their professional colleagues trained in law, education and civil rights – and thereby gain insight into a whole spectrum of issues that Israeli citizens and those in the Occupied Territories are facing on a daily basis. Based in Jerusalem, we spent the first day gaining an insight into some of the grotesque consequences of the Separation Wall that now scars the landscape of Jerusalem and the surrounding countryside. Although the wall – built, ironically, by Palestinian workers with concrete bought from factories owned by President Mahmoud Abbas – has given Jewish Jerusalemites a much greater sense of security, its ugly presence is a constant reminder that Jewish security has been bought in exchange for increased hardship for east Jerusalem Arabs: hospitals that were once ten minutes away by car now require a two hour circuitous trip, around Jerusalem and through two checkpoints; livelihoods have been ruined, and families divided. The shock of the aesthetic desecration of Jerusalem – and Bethlehem, now surrounded by a ‘sleeve’ of brutal concrete that enables pious Jews access to Rachel’s Tomb, but denies access to Muslims, for whom it is also a site of prayer – is mirrored in the moral collapse at the heart of the government’s policy: although Israel has the right and duty to protect its citizens from attacks, the Wall was the most extreme solution available. We witnessed the ways in which its route was designed more for future political purposes – to make territory easier to annex in any future settlement – than for security purposes. Although one reads about these issues, it is not until one sees the reality on the ground that something of the human dimension to these actions becomes clearer. And it is the human costs that the RHR workers and rabbis are focussed on and helped us understand in some depth. Many of the projects we visited are working at grass-roots level on inequities that ordinary Israelis suffer: single mothers in Hadera who need help with economic and legal problems or domestic violence; Bedouin in the Negev whose civil amenities are far inferior to the Jewish neighbours, or whose land is appropriated for reforestation by the JNF; Orthodox women who suffer discrimination in their communities… the work of RHR embraces a bewildering variety of causes, often in partnership with other NGOs, some of whom – like the New Israel Fund, Yisrael Hofshit, and Citizens for Equality – we were also able to meet. Bringing specific human rights grievances to the attention of the Israeli public while pressuring the appropriate authorities – from local courts to the Knesset – is an endless job. As a group we moved from being depressed, angry and perplexed at some of the glaring injustices – particularly on the West Bank where Orthodox settlers are currently engaged in a series or random attacks on Palestinian homes as well as the fire-bombing of mosques – to feeling stirred and inspired by some of the RHR workers who are battling for the soul of Israel, case by case, family by family. In the light of these ideals, the people we spoke with from RHR were vocal in their opinion that Israel was failing to live up to what it aspired to at its beginning – but that individuals and organisations both in Israel and in the diaspora had an ethical imperative to hold each Israeli government to account for their failures, and that a love of Zion – being a Zionist today – necessitated a commitment to redressing injustices wherever they occurred. This entry was posted in Trips and tagged BFRHR, Israel, Jerusalem, RHR, South Hebron Hills, Tour, West Bank on February 23, 2012 by admin.